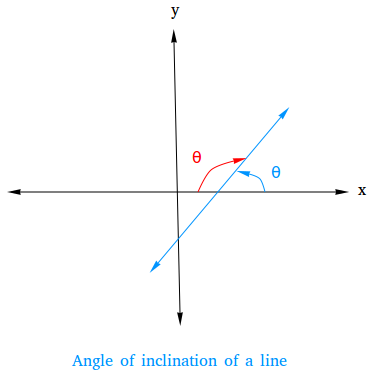 The inclination of a line or angle of inclination is the acute or obtuse angle that is formed when a nonhorizontal line intersects the x-axis. 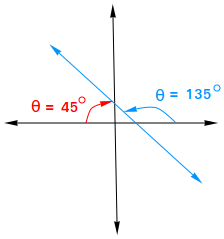 The inclination of a nonhorizontal line is the positive angle θ with θ less than 180 degrees and measured counterclockwise from the x-axis to the line. In the figure above, there are two angles. 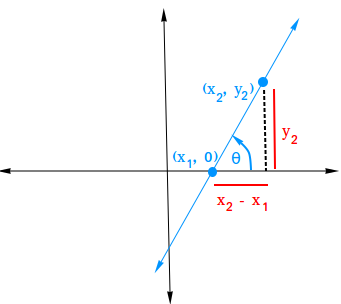 However, the angle in blue is the angle of inclination since it is measured counterclockwise according to the definition. We see that the slope is positive. 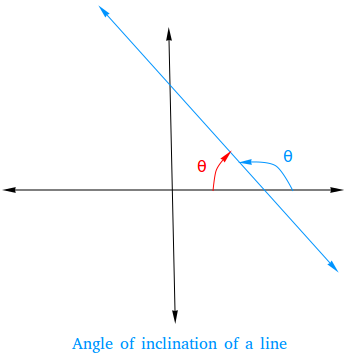 When the slope is positive, the angle of inclination is an acute angle. In the figure above, you can again see that there are two angles. The angle in blue is once again the angle of inclination since it is measured counterclockwise according to the definition. Notice though that this time the angle is bigger than 90 degrees and the slope is negative. When the slope is negative, the angle of inclination is an obtuse angle. 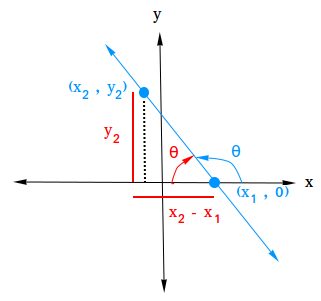 Notice also that when a line intersects with the x-axis, 4 angles are formed as shown below. The relationship between the slope of a line and its inclination is given by the following equation. Consider the following figure. 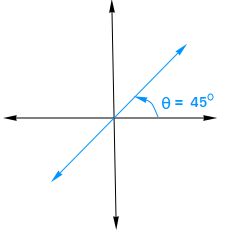 Point (x1, 0) intersects the x-axis and (x2, y2) is another point on the line. If m = 0, θ = 0 since the line is horizontal. Therefore, the result is true for horizontal lines since m = 0 = tan 0. 1) When the line is vertical, the inclination of a line is 90 degrees. In this case, there is no answer for the slope. 2) When the line is horizontal, the inclination of a line is 0 degree. Type 45 degrees and use the tan key on a scientific calculator. Now suppose, you are given a slope of 1 and want to find the angle of inclination. Type 1 and use the tan-1 key on a scientific calculator. Type 135 degrees and use the tan key on a scientific calculator. Now suppose, you are given a slope of -1 and want to find the angle of inclination. Type -1 and use the tan-1 key on a scientific calculator. As you can see -45 degrees is not the 135 degrees angle we started with. To get 135 degrees, you need to add 180 degrees to 45 degrees.